Srinivasa Ramanujan was raised in a poor family in a poor nation, and showed early aptitude by mastering a trigonometry text when he was about ten years old. During his high school years he studied a book about advanced mathematics, Synopsis of Elementary Results in Pure Mathematics, by George Shoobridge Carr (1837-1914). Written as a reference work for professional mathematicians, Carr's book included no serious explanation of the concepts being dealt with, just a collection of theorems presented for readers presumed to already have a serious grounding in the topic, which Ramanujan certainly lacked. But he found the book fascinating, became even more obsessed with math, and began making his own. After high school he tried to gain admission to college, but was rejected due to his poor test results on any topic but math. In his 20s he took a clerical job with the Madras Port Trust, still spending all his spare time on mathematics, and after having several papers published in the Journal of the Indian Mathematical Society, he sought wider recognition by sending his work to several of the world's most famous mathematicians. In letters, each written by hand and beginning with the line "I beg to introduce myself", he mailed eleven pages of mathematical equations to at least three renowned mathematicians, but only Cambridge's G. H. Hardy responded. Hardy had been perplexed by Ramanujan's letter, as it mostly restated well-known mathematical principles — well-known to Hardy, but rediscovered by Ramanujan on his own. Intermingled with the familiar, however, were occasional findings that Hardy had never seen before, which he recognized to be mathematically sound. He was up past midnight reading the letter and following the theorems with excitement. The two men corresponded, and with Hardy's letter as credentials, Ramanujan was able to find work as a research scholar at the University of Madras. Hardy arranged for Ramanujan to join him at Cambridge, where he arrived in 1914, and the two scientists became awkward friends and enthusiastic collaborators on several mathematical papers. Hardy wrote that he considered Ramanujan the most brilliant man he had ever met. 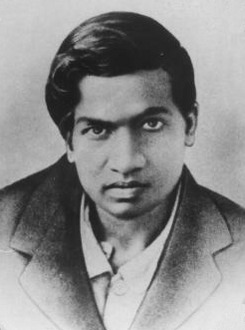 Ramanujan was awarded a BS in Mathematics at Cambridge in 1916 on the basis of his independent research and a dissertation on highly composite numbers. In 1918 he was elected to full membership in the Royal Society, the United Kingdom's national academy of science, and in the same year he became the first Indian elected a fellow at Trinity College, Cambridge. Amidst the harsh British winters and the dietary, religious, and social challenges of living in a nation little known to him, Ramanujan's health faltered, and he returned to India in 1919, where he succumbed to tuberculosis at the age of 32. He left behind several notebooks of arcane but unexplained mathematical calculation, which have been studied as a mystery to be unraveled in the decades since his death. His findings made him the namesake of the Ramanujan graph, Ramanujan modular functions, Ramanujan prime numbers, Ramanujan's sum, Ramanujan's tau function, and Ramanujan theta function, and his work has influenced areas of mathematics including automorphic functions, ciophantine analysis, continued fractions, definite integrals, elliptic functions, highly composite numbers, modular forms, molecular physics, multiplicative number theory, probability theory, q-series theorems, statistical mechanics, the theory and partition of numbers, and theta and mock theta functions. Since 1997 the academic Springer Verlag press has published The Ramanujan Journal, dedicated to developments related to his work. Vaishnavism sect of Hinduism, perhaps best known in the West as the source for the Americanized practice of Hare Krishna.